OPINION – Caribou replacement to be deferred? Word from Defence and industry sources is that the long awaited AIR 8000 Phase 2 battlefield Airlifter (BFA) – i.e. the Caribou replacement – may fall victim to the Gillard Government’s stubborn ‘at all costs’ determination to return to a budget surplus next year. 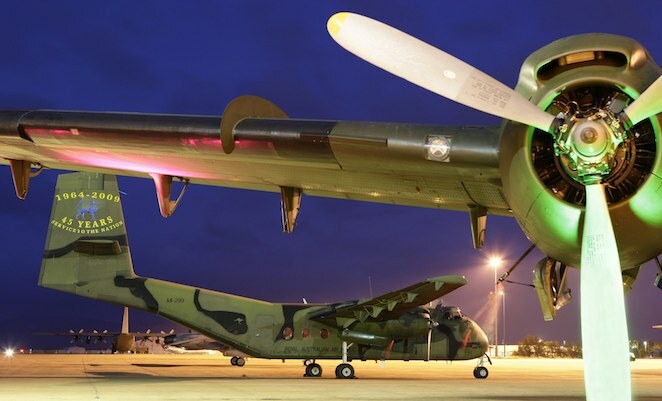 Defence has been trying to replace the Caribou’s fixed wing STOL tactical transport capability for nearly 30 years, going back to project AIR 5190 in the 1980s. It came close in 1999 when the CASA (now Airbus Military) C295 was reportedly selected, before that project was cancelled by the Howard government as a cost savings measure. Ironically, the cost of resurrecting and supporting the drawn down Caribous for an extra decade probably cost as much or more than 10 new C295s! This time round, the Alenia C-27J – which the C295 beat in 1999 – is the RAAF’s BFA of choice, and a decision was thought to be imminent late last year. But January’s decision by the Pentagon to cancel the US ANG’s C-27J program means any advantages in buying that aircraft through the preferred US government FMS brokered deal is now gone. It’s generally accepted that – despite its acquisition and operating cost advantages – the C295 won’t be selected as it doesn’t have the capability the ADF wants. So with a direct commercial sale of the C-27J the only other option, observers have suggested that it may just be getting too hard, and that government may instead take the estimated $1.4 billion set aside for the project in the DCP off the table and either defer the project yet again, or cancel it outright. So what are the alternatives for the ADF? The DMO’s Head of Helicopter Systems RADM Mark Campbell suggested in a recent interview with AA that some of Army’s CH-47D Chinook fleet – which has just been supplemented with the addition of two ex-US Army machines – may be retained when the seven new CH-47Fs arrive from 2014. It is expected the two Chinooks currently deployed to Afghanistan will likely be stripped and left there when Australian forces withdraw in 2014, leaving five relatively fresh CH-47Ds and a couple of spare drivetrains at Townsville. The 12 Chinooks, from which it is expected a core fleet of 8-10 machines could be drawn – would go some way towards meeting the ADF’s battlefield airlift requirements, albeit at a much higher operating cost per hour and with less range, speed and flexibility. If, as has been suggested, the ADF still has a requirement to carry Supacats and G-Wagons, then other options include retaining and upgrading some of the remaining eight C-130Hs, although this will not be a popular suggestion within the RAAF, or assigning part of the role to 37SQN’s C-130Js and supplementing that fleet with additional airframes or maybe even bringing some A400Ms or more C-17s in over the top. Ultimately the people who will suffer from this decision are the members of the Army. This is just typical of a Labor government who in history always strip the ADF of desperately needed assets. My message to Stephen Smith is clear, “you can’t soar like an eagle when flying with turkeys”. What a surprise. The traditionally dysfunctional relationship between a federal Labor government and the ADF continues. I think it’s a bit more than that. The project itself has been somewhat dysfunctional for decades, in that the ADF has apparently been unable to truly define what it wants a BFA to do. At first they wanted the replacement to emulate the Caribou’s STOL capability in a world that has little requirement for that anymore. But if STOL was truly a high priority requirement, they’d have chosen the V-22. Now what they want really looks like a mini-Herc, so there is a valid argument to get a couple more C-17s and to just use the Hercs in the BFA role, and to sacrifice the very occasional mission that requires you to get into a short rough strip. The government appears to be thinking very short term at the moment – it realises it has a long shot to get re-elected next year and therefore is going all-out for a surplus to try to bolster its financial management credentials. Is the Twin Otter too small? I see that a new company in Canada has bought the rights to build the the old girl again, I seem to remember the army having Twatters in Darwin not that long ago. The longer we live without a Caribou / Mini-Herc BFA, the greater the arguement becomes that maybe we don’t really need one. Just writing an updated opinion piece which addresses some of these and other questions and issues, and which should be posted shortly. MV-22 capable of fulfilling this role? Not too sure of the weight lifting specs, but I’m guessing a G-Wagon out of the question. Why the sudden back off by the US with the C27? Surely alarm bells should ring. Transferable payload between the BFA and a Chinook is more important than from C130. Quick turn around at the front is what is needed. Go with the original C295 plan. Chinooks! If importance in lift is recognised in the value of a sixth C17. Then why is it not recognised the great benefit the Chinook has to troop support and disaster relief. The RAAF wins on this and it should be the army as the focus. Stephen Smith is a peanut! Funny how he keeps wanting to buy from the US. Did he promise some favours when previously in foreign minister position? Remember when we had 12 Chinooks and 24 Caribous! Maybe the government and defence should learn to upgrade assets and replace attrition and not dispose of assets so quickly. A simple solution that many nations do, so not us!